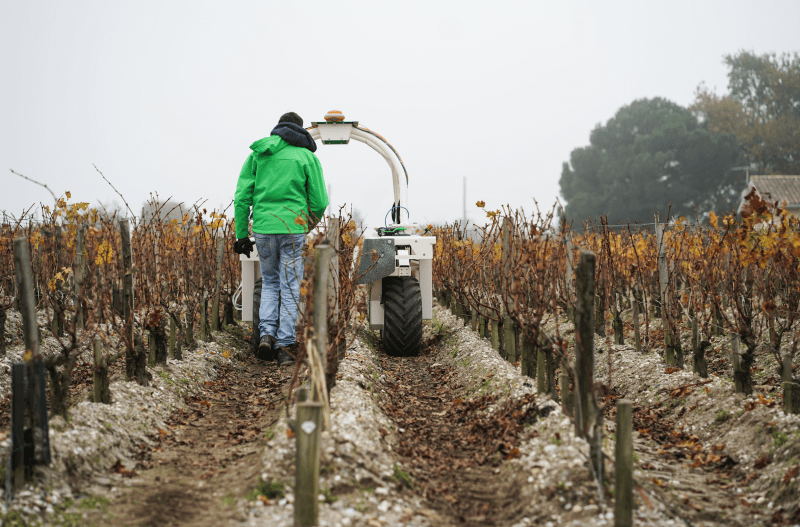 Château Clerc Milon reports on the first trials in its Pauillac vineyard of TED, the first multi-purpose straddling electric robot specially designed for soil cultivation of high density vineyards. The trials mark the culmination of an ambitious project that started with a desire to address a particular issue. Vineyard work involves a number of time-consuming and laborious tasks, such as mechanical weeding beneath the rows. Baron Philippe de Rothschild, the owners of Ch. Clerc-Milon, therefore decided to take part in the development of a specific solution, in keeping with its long-standing policy of taking a responsible approach to the protection of its vines and terroir through measures such as banning chemical weedkillers from all its vineyards and in June of this year, Baron Philippe de Rothschild concluded a partnership with Naïo Techologies in order to combine the start-up’s technological expertise with the skills of its own technical staff. This innovative vine-tending initiative is just one aspect of Baron Philippe de Rothschild’s broader environmental policy. The company draws on current best practice to limit the use of plant protection products at all its estates and is firmly committed to further progress. In pursuit of that goal, the technical staff uses sustainable, organic and biodynamic techniques with a strong emphasis on biocontrol solutions. As a result of this policy, the frequency of treatments on the estate has been reduced by over 30% since 2008.